Fovi is a San Francisco startup which helps new moms with their physical and emotional wellbeing. It recently launched a limited pilot which delivers professional postpartum coaching sessions over SMS and phone calls. In September 2018, Fovi’s founder Chelsea reached out to us to ideate and co-design a mobile application as a postpartum symptom tracker. The main goal of this app is to allow users to effortlessly log and health coaches to effectively track postpartum symptoms for future treatment. Due to our limited medical background, our team decided to scope down to focus on only postpartum depression tracking, the #1 complication of pregnancy and childbirth as our minimum viable product (MVP). In the long term, we will incorporate more symptoms about physical wellbeing for users to track and tackle. Why Postpartum Depression Shouldn’t Be Ignored? In the U.S., there’s cultural and societal pressure driving women to return to “normal” state as soon as possible after giving birth. While families and friends do provide support after childbirth, the emphasis is always placed on the baby and barely on new moms. Research shows that nowadays nearly 1 in 5 American mothers experience significant postpartum depression. So how can we encourage new moms to really evaluate their own needs and take better care of themselves? We started the user research by analyzing SMS records from the pilot program. From the SMS chat history and coach call information, we were able to synthesize typical postpartum symptoms and advice. After taking a close look at the interaction between coaches and new moms of the pilot data, we found that their communication is unbalanced. In most cases, coaches talked much more than new moms. In addition, Chelsea also suggested that since most new moms could use Fovi at night because of their hectic schedules during the day, so the visual identity should be night-friendly, not too disturbing at night. Ideation: How to Encourage Mom’s to Log and Track Symptoms? 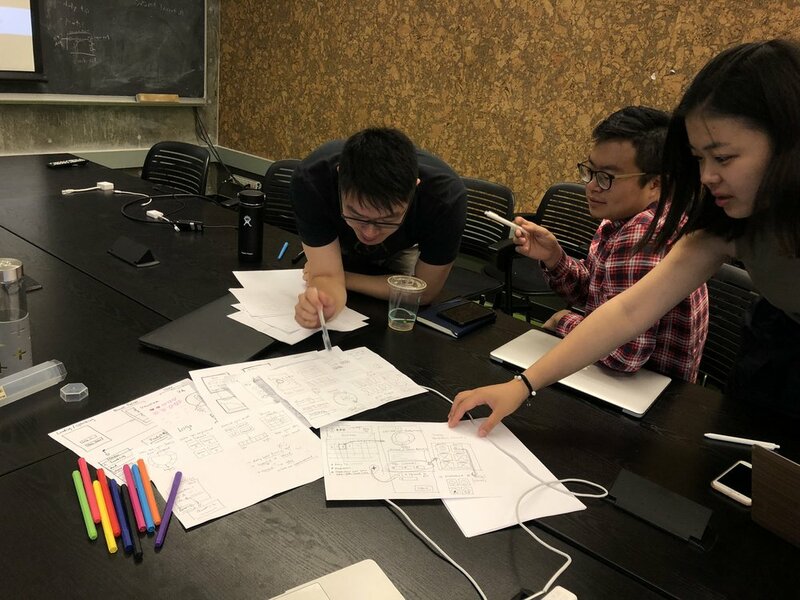 After we confirmed with Chelsea our core design principles, we started a 2-hour brainstorming session to share our own ideas of the user flow and feature prioritization with the group. Crazy 8 #1. How to Encourage Users to Log Their Symptoms Regularly? Crazy 8 #2. How to Make the Symptom Logging Flow Simple and Clear? 1) Chat with Coach: users can interact with both a chatbot and an actual coach. The chatbot will remind users to track symptoms daily, report progress and alerts and offer quick advice on symptoms. A coach will get involved whenever users have further questions after interacting with a chatbot. 2) Schedule a Coach Call: users can schedule a call with a professional postpartum coach for more in-depth and custom feedback. 3) Log Symptoms: users can log their daily symptoms that allows Fovi to take more actions when the situation is worse than certain thresholds and allows users to track their own progress over time. 4) Track Symptom Progress: users can track the progress of each of their symptoms and view the changes over different time period through the interactive data visualization. 5) Edinburgh Postpartum Depression Survey: the 10-question survey is a professional and efficient way of identifying women at risk for perinatal depression. Fovi will suggest this survey whenever users show any depression-related symptom. 6) Today’s Advice: users will receive a short piece of custom daily advice based on previous symptoms they’ve recorded through Fovi. They can click learn more and save the advice to follow in the long term. After we divided into small groups to work on the initial sketch of Fovi, we came together to conduct a quick user testing with our first wireframes, with two different versions of homepages and the chat flow. Most of the feedbacks were related to the busy homepage and vague core features, which drove us to distill the MVP in the next iterations. This was my first time to design experience for postpartum new moms, a highly sensitive and special group in need of more attention and understanding from others. Before taking a plunge into unchartered water, I did a lot of research in this area and chatted with Chelsea and her expert team a lot to seek professional advice. Our team spent more than half of the time on user research and validating the user flow before we started the actual design. Alongside the design process, we still centered an iterative feedback and improvement cycle around the users’ needs and ideas. Every small step we took was based on careful thoughts to make sure this unprecedented experience works well with new moms’ emotions and expectations. This project turned out to be not only a short problem-solving process for the client but a valuable life-long learning experience for ourselves about such critical social issues.